Which acts by educators are “racist” and which are “antiracist”? How can an educator constructively discuss complex issues of race with students and colleagues? In Everyday Antiracism leading educators deal with the most challenging questions about race in school, offering invaluable and effective advice. Contributors including Beverly Daniel Tatum, Sonia Nieto, and Pedro Noguera describe concrete ways to analyze classroom interactions that may or may not be “racial,” deal with racial inequality and “diversity,” and teach to high standards across racial lines. Topics range from using racial incidents as teachable moments and responding to the “n-word” to valuing students’ home worlds, dealing daily with achievement gaps, and helping parents fight ethnic and racial misconceptions about their children. Questions following each essay prompt readers to examine and discuss everyday issues of race and opportunity in their own classrooms and schools. 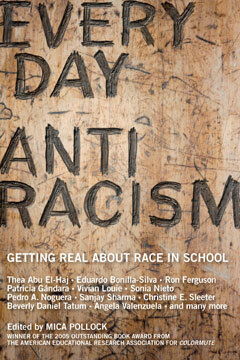 For educators and parents determined to move beyond frustrations about race, Everyday Antiracism is an essential tool.